Coaster Photo – Bradley Beach Mayor Gary Engelstad swears in Edwin Hernandez as the newest member of the police department. The Bradley Beach Borough Council welomed a new member to the Police Department and said farewell to a longtime dedicated employee. 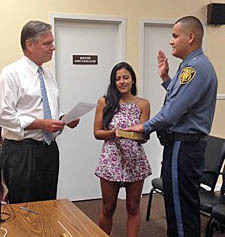 Edwin Hernandez was administered the Oath of Office during the Bradley Beach Boriugh Council meeting Aug. 25. “When this availability came up, he was at the top of the list,” said Police Chief Leonard Guida. “Growing up, I always dreamed of this and thanks to the chief, captain, mayor and council, I’ve completed my dream,” Hernandez said. During the meeting, Tutela made her final announcement as Secretary of Tourism saying that there will be a tribute concert to Earth, Wind, and Fire on Saturday, Sept. 5 at Riley Park. “I’m sorry to see her leave. I hope that she is born to run and has lots of fun and dancing in the future. Thank you Rae for everything,” said Councilman Harold Cotler. “She’s a feisty lady, but she always has our best interest at heart,” said Councilman Norman Goldfarb. Engelstad made a final note that the Monday Opera Series, which Tutela began, will continue despite rumors of it being cancelled.